Castanet Wooden Bee is a musical instrument with a lovely yellow and black design that clicks and clacks when you squeeze it together. 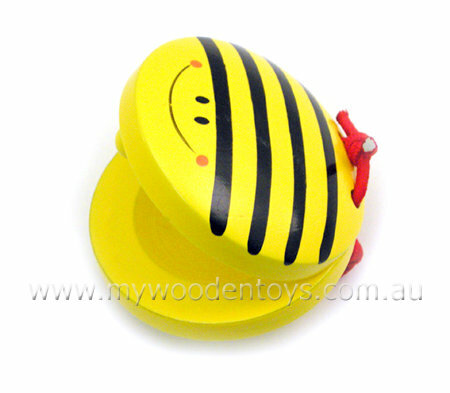 The Bee Castanet is very smooth and great for little fingers to operate. It is held together with strong elastic so they push together and bounce apart easily. This instrument is a lot of fun, so get ready for some Bee Spanish dancing at your house. Material: Wood, Child-safe paint, elastic. We like this because: "bright colours and a lovely happy bee design."